Stubaier Glacier is the highest ski area in Austria Tyrol, 45-minutes from Innsbruck. 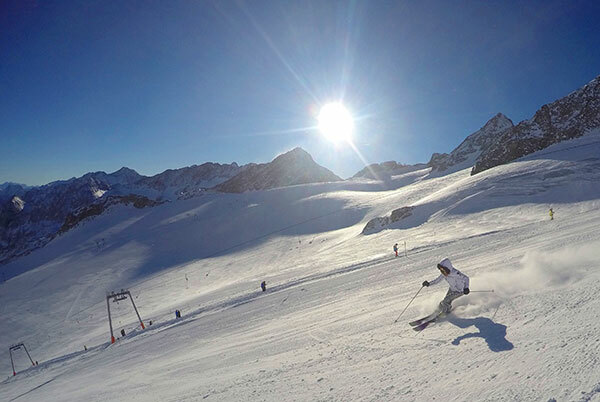 Stubaier Gletscher (in German) is Austria’s biggest glacier skiing with 25 lifts and over 110 kilometers of prepared ski runs, and a long ski season – October to June. Ride the long gondolas with us in our ski video, to ski high alpine, highly scenic terrain, 10,000’ where you can see nine 3,000 meter peaks – Italy – Austria – Switzerland. Skiing at Stubaier Glacier offers wide open pistes, powdery white snow bowls and a long run to the base for 4,500’ vertical – a 6 mile ski down to the gleaming gondola building at the base. See our review of skiing Stubaier Glacier near Innsbruck.